I know that choosing the right guitar teacher is hard. You’ve got all of these people advertising themselves, but you have no idea how good or bad they really are. Since I’ve been doing this for a long time, I’m confident enough in my work that I’m willing to put my money where my mouth is. If you are not 100% happy with your lesson, it’s free! 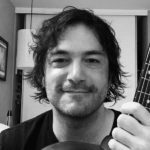 I’ve been a professional musician and guitar teacher for the past 15 years, helping hundreds of students be the best guitar players they can be. Whether you just want to play a few songs for your friends, be the guitar player in the band or aspire to be a full time working musician – I can show you the way to get there. I’ll tailor the lessons to your goals, your musical taste and the amount of time you have to practice every week, and create a personalized guitar curriculum that fits you perfectly. Playing the guitar is my life, my passion and my livelihood – and it shows in the way I teach. I started playing almost 20 years ago, and have been practicing every day since. I had a lot of great teachers along the way, and I incorporate the best in each and every one of them in my lessons. Having been a working guitar player for a decade now, I learned a ton of priceless tricks from fellow musicians and artists, that I’d be happy to share with you. I’m also a huge guitar nerd and gear head. I’m always happy to talk guitars, amps, pedals, cables, accessories – you name it. I’ve used some of the best guitar gear known to man and I keep buying more and more stuff every week. 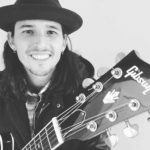 I can help you find the sound you’re looking for, point you in the right direction when it comes to guitar equipment and accompany you when you pick out new or used gear. Plus, you are free to try guitars and pedals from my private collection. What should I bring with me to my first guitar lesson? Your guitar, a notebook and a will to rock and roll! Why do I need to bring a notebook with me to a guitar lesson? The notebook is going to be your own personal custom fitted guitar learning book. I write down everything we talk about in our lessons and make sure your homework for the week are crystal clear. This way, whenever you need to remember an old subject or concept we already covered, you can just leaf through your notebook and find it. In addition, I have found that people tend to grasp and fully understand certain topics better and faster when they’re explained to them visually. Can I borrow a guitar or do I have to buy one? You can definitely borrow a guitar, just make sure that you are free to keep it for a while, because you’ll need it to practice at home between lessons. Do you teach music theory? Will I have to learn some? I do and you probably will, but the good news is that with me you’ll never learn theory just for the sake of learning theory. I teach what I like to call “Applicable Theory”, which is a fancy way of saying that whenever we talk about a theoretical concept, I’ll show you how to use it on the guitar and have it contribute to your playing right away. 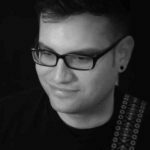 In my experience, this way of learning makes music theory much less “scary” for aspiring guitarists and really helps them to translate their new found theoretical knowledge into better guitar playing. On a side note: when explained correctly and in the right context, music theory is not only easy, but can actually be pretty fun. For real! What kind of a guitar should I buy? If you’re a beginner, I recommend that you get a Classical Guitar, which is sometimes referred to as a Nylon String Acoustic Guitar. You can get a pretty decent one for about $100, and they usually last for years. There are a lot of other advantages to starting out with a Classical Guitar, such as the the nylon strings – which are easier on your fingertips, the wide and easy to reach neck – which better accommodates all hand sizes and the bare simplicity of the instrument – that helps to focus on the actual playing. Can I start learning with an acoustic or an electric guitar? You can definitely start learning with either an acoustic or an electric guitar, but you should know it might be a bit harder. On the other hand, you won’t be the first to do that, so feel free to try it out. If I ever feel that you’d be better off switching to a classical guitar, I’ll be sure to let you know. I like to wear my fingernails long. Will I have to cut them in order to play the guitar? I always felt self conscious about my hands being too big/small - can I play guitar? Not only can you play guitar, my friend, but having irregular size hands might actually turn out to be an advantage, allowing you to easily master techniques that others find hard. Besides, there are specially fitted guitars for people with smaller hands, such as 1/2 and 3/4 size guitars. For you bigger handed folks, there are plenty of models that offer thicker necks and wider fretboards that will make you feel right at home. The bottom line is: don’t worry about it, you’ll be playing guitar in no time! How much will I have to practice in order to be a good guitar player? There’s a direct connection between the amount of time you spend practicing every day, and your ability to play the guitar. However, since playing music is not a competitive sport, you won’t have to practice 2-3 hours a day to be able to play songs and have fun. I usually instruct beginners to start with 10-15 minutes a day, 5 times a week. As we progress, you’ll need to invest more time into your practice routine. Ideally, I’d like my more advanced students to practice for about an hour a day, 5 times a week. However, it is entirely up to you. If for any reason you can’t spend that much time practicing, I can give you a weekly exercise that will fit your timeframe, while incorporating some actual practice time in our weekly lessons. While you might advance a bit slower, at least you’ll be doing it efficiently and have fun in process. I’ve been playing guitar for a while now, but I feel stuck and don’t really know how to improve my playing. Can you help me with that? What are your influences and who are your favorite guitar players? "I have really learned allot from him, and plan on seeing him weekly until I can play better than he can ( never happen :) )"
"The most awesome patient, talented teacher ever! I highly recommend his lessons!" "His enthusiasm for what he is doing makes our time together fun and meaningful." "The tons of knowledge this guy has is really inspiring, from Beethoven to Eric Clapton, he can teach you the 5th symphony or Comfortably Numb with the same passion." "Jacob has an answer for every question you throw at him and it’s obvious that he is really passionate about teaching." "Jacob is a really down to earth guy who immediately understood my musical style and focused mainly on what I wanted to know, unlike other teachers I’ve had experience with." "I can honestly say, I learned more in two hours, then I have in the previous two decades. I will be continuing my lessons with Jacob for many years to come"
"He is so personable. You feel like you’re just hanging out, but you leave having learned much more about playing guitar"
"He is not only very patient but absolutely the best teacher I’ve ever had"
"I am playing better than I ever have. I really look forward to each weeks lesson!" Jacob is very engaging and thoroughly knowledgeable. Don’t be fooled by the grim from door, once inside the tiny studio this guy is really really good. As an absolute beginner I was more than a bit intimidated before stepping through his door, after one session with Jacob I am practicing and cant wait to go back and progress my guitar playing. 365 Guitar Licks Project aims to bring fresh musical ideas and concepts to guitar players on a daily basis. The format is simple: a daily 1-minute video that demonstrates a lick twice in normal speed, and then twice more slowly, so you can figure it out and play along. Every lick also includes full notation and TAB, that you can download as a PDF or a Guitar Pro file (both gpx and gp5). The best part about it is that it’s 100% free! All the videos are up on YouTube and the download links are right there in the video description. So if you’re looking to diversify your playing and enrich your musical vocabulary – this project is exactly for you! You can read more about the project, and how I got the idea to start it, right here. 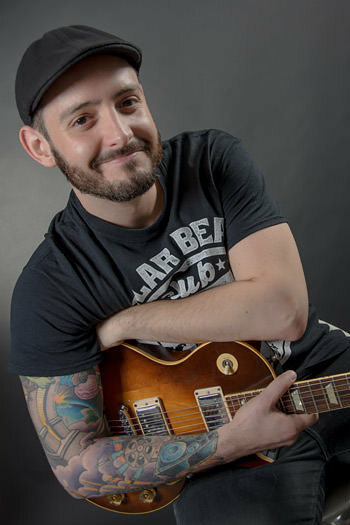 Check out some of my online lessons at GuitarMasterClass.net – one of the biggest guitar teaching websites in the world. Every lesson includes 9 full HD videos, backing tracks at various tempos, a jam track and full TAB in ASCII, PDF and Guitar Pro formats. Those guys are so great that you can actually get the performance video + TAB for free – no subscription necessary. While you’re at it, make sure to browse their extensive library of online lessons. There are tons of awesome lesson available. GuitarMasterClass is a place where you can improve your musical skills and meet people with similar interests. The main focus is to having fun while learning. GuitarMasterClass also strives to inspire students to find their own unique style. To help you become a great guitarist, we have collected a crew of skilled guitar instructors from all around the world. All the licks, as well as many more free online guitar lessons, are available on my YouTube channel.